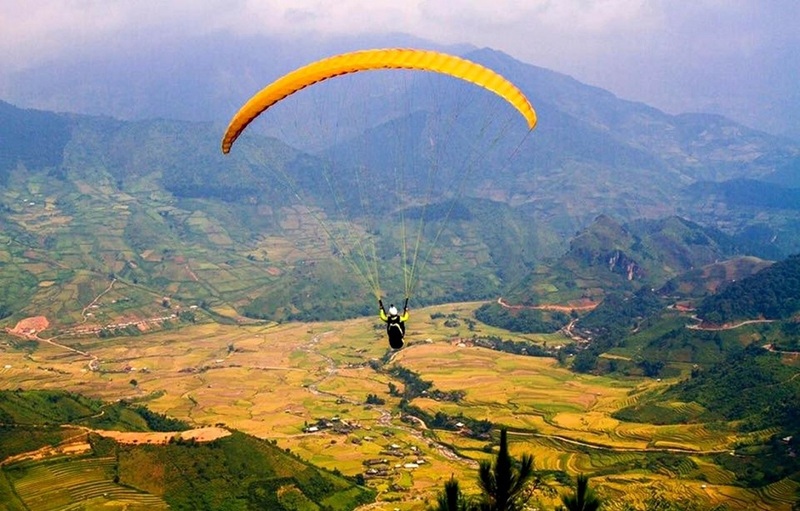 The largest paragliding festival will take place from September 22-24 at Khau Pha mountain pass, Mu Cang Chai district, Yen Bai province. The annual event themed "Flying over ripening rice fields" is expected to attract thousands of visitors to the Northwestern region to enjoy the beautiful landscape of golden rice and terraced fields. Khau Pha mountain pass, about 1,200 meters above sea level, provides a breathtaking view of stunning natural scenery. It is rated as one of the four most beautiful paragliding sites in Viet Nam and among the top five most beautiful flying spots in the world. Mu Cang Chai has 500 hectares of rice terraces in La Pan Tan, Che Cu Nha and De Xu Phinh communes, cultivated by the H'mong people for centuries. The local terraces are among the 2,500 hectares recognized as national heritage sites in 2007 by the Ministry of Culture, Sports and Tourism. The locality is about 1,000 meters above sea level, making it impossible to grow rice the same way as in deltas. Local residents grow rice in terraced fields to prevent water flowing downhill. Terraced fields in Mu Cang Chai are beautiful all year round. Visitors in March can see glittering ponds before locals transplant rice seedlings from April to May. After May, the hills are covered in green until the fields start to turn yellow with ripe rice in early September. One suggestion for you is to make a trip from Sapa to Mu Cang Chai. With this trip, you will be enjoyed the beautiful terraced fields of northern Vietnam. Then, at Mu Cang Chai, you will join the largest paragliding festival at here. This would be a great idea !! !